A small business cash advance is essentially an installment loan, but it is usually due in one lump sum payment and at a very high interest rate. Whenever possible, small businesses should avoid this most expensive form of debt. However, there are some scenarios where taking a cash loan advance will provide necessary funds to either pay other debts or purchase inventory. You will be expected to meet application requirements when you do decide to take a cash advance loan. Generally, cash advance lenders have lower standards than traditional lenders. Like all loan applications, your credit score will come into play. These unique loans, though, rely more on your ability to repay the loan than on your loan payment history. Your ability to repay the loan, known as your income, will be more important than your loan payment history, or credit. This is because these loans are often extended as an option of last resort for borrowers who do not qualify for traditional loans. Your credit, nonetheless, should be adequate. 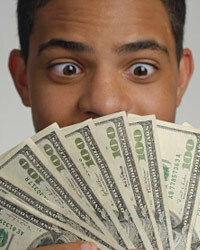 Some cash advance lenders, however, will not even require a credit or background check. Instead they will require income verification. This allows them to see your relative ability to repay the loan in the future. If your business has a history of high revenue, the lender may extend you a loan regardless of a poor history paying debts. The most important thing to be aware of when you are applying for a small business cash advance is the loan terms. These terms will generally be less favorable than terms on a loan from a traditional lender. Understanding the terms is key to assuring you will not be assessed high fees unknowingly in the future. Pay attention to interest rate as well as financing fees if you are late on a payment. Cash advance lenders do not typically provide for a grace period. If your payment is not made on time, they will immediately compound your interest and charge you a fee. On the other hand, they also do not typically charge prepayment fees, meaning you can pay your loan off at any point before it is due. Consider revolving credit lines for your business before applying for a cash advance loan. Having a business line of credit or business credit card can help you continue to place orders for inventory even if your accounts receivable are delayed. The line of credit can also assist you in purchasing items for expansion of services.